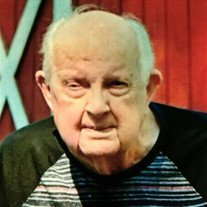 William C. Johnson, 94, of Sherwood, Arkansas, passed away November 11, 2018. William was born on May 1, 1924 in Pike City, Arkansas to the late Collier and Maple Cooley Johnson. He was a World Word II Veteran and retired from the United States Air Force as Chief Master Sergeant. William is survived by his wife of 70 years, Norvelle Johnson; sons, Bill Johnson (Jill) and Charles Johnson (Debbie); grandson, Hunter Johnson; and great grandchildren, Grady Dean Johnson and Hattie Clarke Johnson. Graveside services will be held at 9 AM, Friday, November 16, 2018 at Arkansas State Veteran's Cemetery, 1501 W. Maryland Drive, North Little Rock.